Coverage: Live coverage of eight games on BBC One and BBC One HD. All of Scotland's matches live on BBC Radio Scotland, Ireland's on BBC Radio Ulster, and Wales' on BBC Radio Wales and BBC Radio Cymru. Live text and commentaries on BBC Sport website and app. 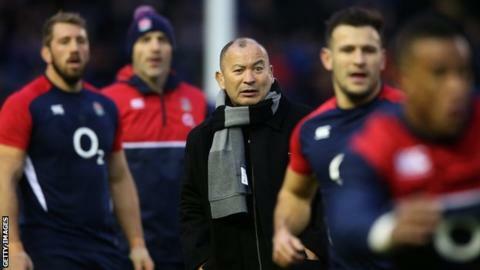 England head coach Eddie Jones wants his new side to maintain their early Six Nations momentum by giving Italy "a good hiding" next weekend. Jones' opening game in charge ended with a 15-9 win in Scotland, meaning England lead the table after the first round of matches. Now England travel to Rome next Sunday, having won all 21 of their previous meetings against the home side. "We control our own destiny. We want to go there and smack Italy," said Jones. The 56-year-old Australian was appointed England's first foreign coach after Stuart Lancaster lost his job following last year's World Cup failure. Lancaster's side became the first host nation to be eliminated in the group stage of a World Cup. Now Jones, who took over after leading Japan to a stunning victory over South Africa during the tournament, is trying to guide England to their first Six Nations championship since 2011. Italy, who are aiming to avoid the wooden spoon for the second successive season, were narrowly beaten 23-21 in their opener in France. The Azzurri led 21-20 with less than five minutes remaining, only to lose when Jules Plisson converted a penalty from the halfway line. "I've already said to the boys that's our aim - to go out there and give Italy a good hiding," said Jones. "Italy are going to be tough because they should have beaten France, but that's our aim."